A visit to the home of Graham and Fay Beeson is a visual feast for the eyes. 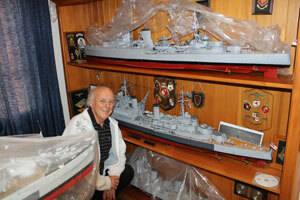 Graham is a model ship builder of some repute, having built around 25 models over the last 60 years. Five of Graham’s model Navy ships are on display at the Navy Museum, with the remainder on show at his home on the Whangaparaoa Peninsula, North of Auckland. Graham’s wife Fay is extremely supportive of her husband’s passion but leaves it up to him to do the ‘dusting’ of his collection of models. The 1956 film Battle of the River Plate inspired Graham’s life-long interest in the Navy and the creation of his very first model, a sailing ship. “I started out building small sailing ships. A book about the Admiral Graf Spee inspired the creation of my very first Navy model,” says Graham. Born in the beach side suburb of Kohimarama in the middle of World War Two, it’s perhaps not surprising that Graham developed an interest in Navy and all things Naval. Despite his interest in the Navy, his career took him in a different direction into the lucrative poultry farming and building trade. He completed his career as a registered property valuer. Graham applied his extensive construction skills to building his own home on a lifestyle block on the Okura River, proudly without a mortgage; a concept which seems completely unthinkable, in the current housing environment! During visits to Auckland Museum and the Navy Museum at its previous location in Spring Street, Graham was surprised to find that there were no models of New Zealand Naval ships on display. Having seen a gap, Graham decided to shift his focus to researching and building models of New Zealand ships and ships with a New Zealand connection. Starting with HMS Achilles, HMNZS Gambia, KM Graf Spee, HMS Exeter, HMS Ajax, HMS Māori, HMS Neptune, HMS New Zealand and HMNZS Otago. Graham’s favourite model, HMNZS Gambia which took around 15 months to build, is proudly displayed in the upstairs ‘gallery’ of his private museum. Four of his models including the HMS Ark Royal are also remote controlled, Graham sails these on the local lake and at model warship regattas. HMS New Zealand which was involved in three battles during World War 1: Heligoland Bight, Dogger Bank and Jutland has pride of place in the Navy Museum. It took Graham two years to build and was finished in time for the centenary celebrations of the start of WW1. Graham’s naval interest extended to a role as treasurer of The River Plate Association for a number of years. As editor of the Association’s magazine, he received a number of invitations to interview those closely involved with the battle. In 2007, Graham travelled to Buenos Aires to attend the 68th Admiral Graf Spee Anniversary. He met veterans of the battle, families and friends. These conversations inspired Graham to write a book on the battle: Admiral Graf Spee; German Pocket Battleship 1934-39 Battle of the River Plate, a Pictorial History available to purchase from the Navy Museum shop and online. Most of Graham’s models are built to a scale of 1:96th; imagine the model increased 96 times and you have the life-size ship! 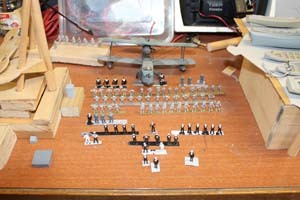 Excellent plans are the key to good model making says Graham. “It is advisable to research the history of each ship thoroughly and good photographs are essential. Visits to the Navy Museum in Devonport give a good guide to the final finish,” he says. Graham’s attention to detail is meticulous, with individual sailors often shown in miniature on his models, as they would have been at a particular moment in history. The hull of each ship, its sup erstructure and gun turrets are all hand crafted by Graham using wood and sheets of printer’s plate. Fittings such as bollards and the individual crew members are spin cast metal and are hand-painted; not a job for an unsteady hand and largely done without the assistance of a magnifier or glasses! Now in his seventh decade, Graham shows no signs of slowing down with six models currently in varying states of construction in his garage. 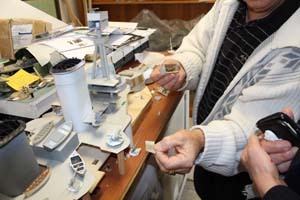 A refit of a model of HMNZS Leander, complete with the torpedo damage it sustained at Kolombangara in the Pacific in 1943, is nearing completion. Graham is also fulfilling a long-term ambition to build a Battle Cruiser; HMS Repulse at his preferred 1/96th scale, is 2.4 metres. A popular public speaker, Graham regularly gives talks to service clubs and hosts static displays of his 1/96th scale miniature naval fleet – The New Zealand Model Navy complete with its own Naval insignia designed by Graham. A number of Graham’s models including: HMS New Zealand, HMS Neptune, Admiral Graf Spee and HMS Achilles can be viewed at the Navy Museum.